This former high school art teacher makes jewelry out of her home studio in Crofton, MD. Her designs are inspired by nature’s patterns which she observed growing up in rural Pennsylvania. She cherishes the slow paced aspect of handmade work and aspires to leave her unique imprint on every piece. Amanda begins each piece by mixing and matching geometric shapes on paper. Once she has established the final design, she uses the Old World technique of lost wax casting which allows her to maintain the organic texture she desires. 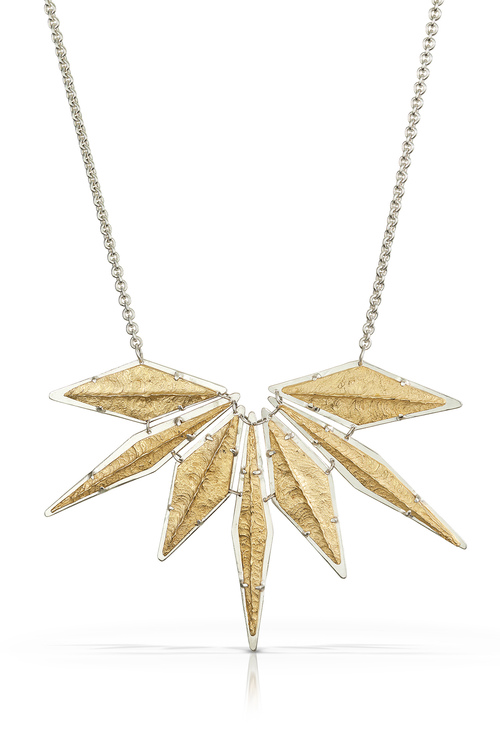 She uses ethically-sourced metals such argentium silver, 14K gold vermeil and solid 14K gold. All items are nickel-free. She uses vermeil more than solid gold to ensure her jewelry is affordable. If requested, she can also melt down solid gold to create new jewelry pieces. Her stunning one-of-a-kind designs have been featured in Washingtonian Magazine and several jewelry magazines. Meet her at Sugarloaf Craft Festivals and pick out (or design!) your perfect piece.